The drill platform at the Cabot Oil & Gas Corp Flower drill site, outside of Dimock. Pa. Natural gas drillers have been able to head off a push in the Pa. Capitol for an extraction tax for nearly a decade. HARRISBURG — Over the last seven years, Pennsylvania lawmakers have introduced no fewer than 67 bills to tax natural-gas drilling companies. In nearly every instance, those measures have died. Supporters of a tax say few other interests have managed to thwart legislation in the Capitol so successfully and for so long, earning Pennsylvania the distinction of being the only major gas-producing state without a severance tax. They point to one reason: the industry's ability to spend tens of millions of dollars on influence. An Inquirer and Pittsburgh Post-Gazette analysis of lobbying disclosure and campaign finance records since 2010 shows that natural gas drilling companies and their industry groups have spent at least $46.6 million on lobbying and another $14.5 million on political donations — many of the latter going to legislative leaders who control the flow of bills in the Capitol and the heads of committees that regulate their business. That does not include donations from related industries, such as pipeline construction or utilities, which also spend generously on lobbying and political donations. "It's difficult to walk through the halls of the Capitol on a session day and not see [natural-gas industry] lobbyists there," said Rep. Greg Vitali (D., Delaware), a longtime supporter of a severance tax. "Their presence is constant." Last week, Republicans who control the House of Representatives blocked yet another push for a tax on gas drilling, this time with higher political stakes: a $2.2 billion deficit and three months without a complete budget. The drilling industry pushes back, arguing that its companies are unfairly singled out despite a track record of creating jobs and other opportunities in once-depressed communities across Pennsylvania. They say drillers do pay taxes, including the so-called "impact fee" that the legislature approved in 2012 in lieu of a severance tax. That money is largely parceled out to local communities — many rural and with struggling economies — where the drilling occurs. Drillers paid about $173 million in impact fees last year — a figure that a leading industry group says is more than the severance taxes in Arkansas, West Virginia, Colorado, and Ohio combined. 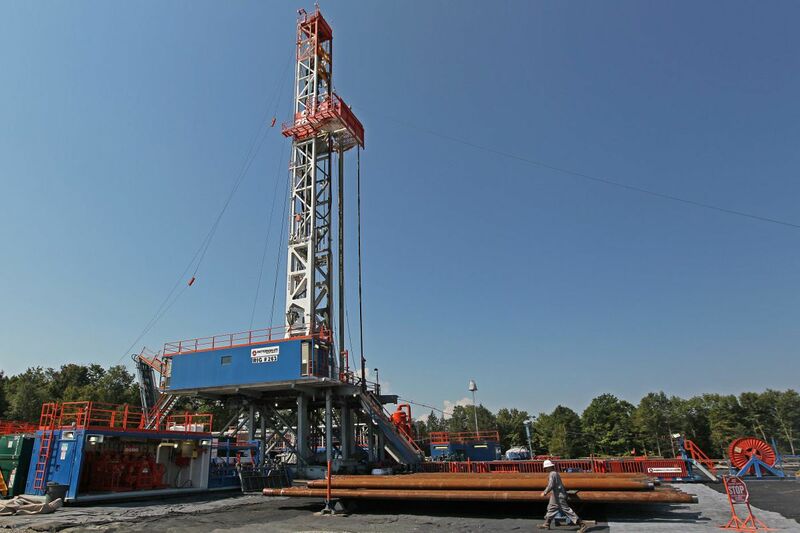 The analysis was done by the Marcellus Shale Coalition, an umbrella group representing drillers and others with a stake in the natural-gas industry. The group based its conclusion on figures from those states' budget offices. The Marcellus Shale Coalition itself, according to its website, does not make campaign contributions — although many of its members do. But it does lobby: state records show the Marcellus Shale Coalition alone has spent nearly $18 million since 2010 on lobbying, according to state records. The advocacy, an industry spokeswoman says , is necessary in part to ensure the industry is "not held hostage by outside special interest groups." "While we prefer our role to be a partner with government, we also understand heavily funded special interest groups have the ability to influence and politicize issues that do not go together, making our advocacy and education efforts even more important," spokeswoman Erica Clayton Wright said in a statement. Though the debate in Harrisburg over whether and how much to tax drillers stretches back nearly a decade, it wasn't until Gov. Tom Corbett's first year in office that the issue reached a feverish pitch. There was intense political pressure to force drillers to "pay their fair share," as the mantra at the time went. It was fueled in part by environmental concerns, amped up by the 2010 documentary Gasland, which turned a critical eye on hydraulic fracturing — or fracking — by companies drilling for gas in the Marcellus Shale. The Shale is a rock formation deep under the earth's surface that runs through New York, Pennsylvania, Ohio, and West Virginia. But Corbett, a Republican, had taken a no-tax pledge during his campaign and opposed a severance tax. The compromise, crafted by the GOP-controlled legislature, was the impact fee: a levy on the number of wells companies drill rather than the amount of gas they remove from the earth. Some lawmakers, backed by environmental and labor groups, believe the impact fee lets a deep-pocketed industry off the hook too easily. One reason it keeps coming back year after year — and likely will again — is because Pennsylvania's budget has been racked with chronic deficits. Those legislators have have pushed more than five dozen bills since 2010 seeking an extraction tax. Most never made it out of legislative committees. Gov. Wolf in his first year in office, 2015, proposed an aggressive tax that would have raised almost $800 million in its second year, and then later more than that. Other legislators have fought to block the tax, certain such a levy would lead the industry to take its money and jobs elsewhere. The legislature's Republican leaders — many of them top beneficiaries of the industry's campaign contributions — have largely backed the latter group. Until this year. In July, the Senate for the first time approved a severance tax as part of a larger plan to raise new dollars to balance the budget. House GOP leaders balked, and then left town. When the House returned last month after a six-week summer hiatus, Democrats and a group of House Republicans — many of them moderates from the Philadelphia suburbs — tried to use a maneuver to force a vote on a Shale tax bill that had been bottled up in a House committee. But the effort failed last week after GOP leaders, including House Speaker Mike Turzai (R., Allegheny) and House Majority Leader Dave Reed (R., Indiana), signaled during a closed-door meeting with their members that they did not support the move. Turzai, according to campaign records, has received nearly a quarter million dollars since 2010 from drilling companies, their political action committees or their trade groups. Reed has received $147,050. It is not clear how much drillers spent to lobby specific leaders or other legislators because Pennsylvania's lobbying disclosure law, unlike in other states, does not require such a breakdown. And because the law doesn't require interest groups to detail what issues they are pressing, it is not clear how much the drillers spent to fight a severance tax as opposed to other issues that affect the industry. Steve Miskin, spokesman for House Republicans, said it was "insulting" to assume that campaign or lobbying money played any role in the leaders' opposition to a severance tax. Those leaders and others have believed for years that a severance tax is bad policy. "We are standing up for jobs and they [drillers] like our stance," Miskin said. Rep. Gene DiGirolamo, a moderate Republican from Bucks County, said he believes some of his colleagues who, like him, support a severance tax got cold feet at the last minute last week. "Republican leadership did not want to bring this issue up," said DiGirolamo. "I think some of the members got worried and shaky, and they decided they couldn't vote for it." Four legislative sources said House leaders only began warming to a tentative budget deal late last week when the shale-tax idea was abandoned by others at the negotiating table. Even when it was part of the budget talks, the severance tax came with provisions that many advocates said would gut environmental protection. Vitali, for one, said the concessions would have outweighed the benefit of having a severance tax. "To me, if this is the price you have to pay, it's too high," Vitali said. "Let's move along." Pittsburgh Post-Gazette reporter Laura Legere contributed to this article. The Inquirer and Post-Gazette used data from the Pennsylvania Department of Environmental Protection to get a list of all companies with active wells in the state that would be subject to a severance tax. The newspapers then ran those companies and related political action committees through separate state databases to learn how much they spent on campaign contributions and lobbying since 2010. Not included were contributions from pipeline companies and electric generators without active shale wells. The state's weak lobbying disclosure law makes it impossible to learn how much was spent just on the tax issue.